In most of my articles, I talk about specific archetypes or meta discussions for upcoming Regionals. But today, I want to take a step back and discuss League Cups. 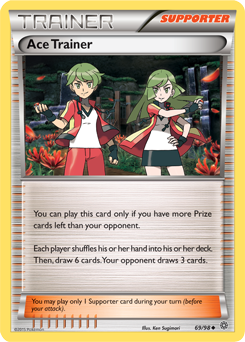 I use them for two main purposes: refining a list for an upcoming Regional and to lock in some easy Championship Points. And I tend to put a lot of time in thought into said League Cups, both in time preparing a list and time reflecting on results. Sometimes it feels like overkill, but the results definitely show for themselves. Ever since I started playing Pokemon TCG, I attended 13 local League Cups in total, and managed to earn points at all 13. And I can attribute all of my top Regionals finishes to lists I refined exclusively at two League Cups rather than through friends or competitive testing circles. So whether you just want to earn CP a bit more consistently at cups or want to top a big event, I think it pays to take your League Cups seriously. And this article discusses exactly that with my personal strategies and thought processes. Why exactly do I recommend League Cups for playtesting? Wouldn’t coaching or an elite testing group offer better results? If you asked me a year ago, I’d probably give you a different answer. But after much reflection, I started to appreciate League Cup testing more and more. Testing alone lets you keep your list a secret and under the radar. Nobody really expected my Clefairy tech at Hartford in 2017. And nobody expected Psychic Malamar to perform well at Philadelphia. This presented a softer opposition at the respective Regionals, with few people preparing tech cards or knowing how to counter my deck optimally. While testing groups offer stronger opposition than League Cups, I think they bring their own bag of issues. First, they tend to focus too much on “spotlight archetypes”. Nobody really wants to test against some weird jank that hasn’t proven itself yet. And in turn this can skew your results. You might over tech for specific matchups just because your personal testing group likes that more than the general community. You might also load your deck with additional “juice” cards to beat the good players you constantly run into, rather than general consistency cards that perform better against a wide field. I eventually started relying on lists from friends towards the end of the season, rather than lists I played at League Cups. This meant I went into events with less playtesting than usual. I also found I bricked games at Regionals a lot more towards the end of the season, which I attributed to lack of time spent refining said lists at League Cups than in the past. For the near future, I intend to redouble my efforts on building simple and strong lists through lots and lots of playtesting, particularly playtesting at League Cups. This kind of methodology definitely takes a lot more time, effort, and thought than borrowing a list from a friend, but given my past track record, it seems I need exactly that to perform well.